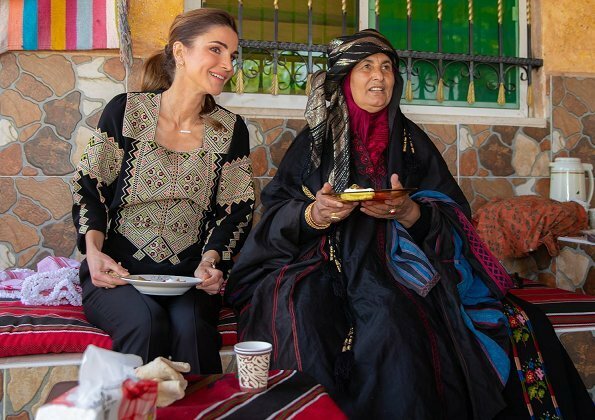 On April 3, 2019, Queen Rania visited Wadi Shueib in Balqa Governorate and met with a group of women from a local charity. The Queen received information about the home based initiatives of the women. Wadi Shueib is the arabic name for the Valley of Jethro. It is a wadi in Jordan draining an area of nearly 180 square kilometers. Excavations confirmed that the area was a major site during Jordan's Neolithic period. Rania always looks stunning in ethnic infused outfits and this is no exception. Exactly. Looking at these photos, I feel as if I was looking at a beautiful picture book. Great cause and a traditional top combined with pants for a more modern look.It's really a beautiful top (would we call it a tunic? a blouse? ), she has worn it with multiple bottoms and it always works well. I also always enjoy seeing her in action with the women of various places, plus it is interesting to see how the others dress. The foods are looking pretty good, too! She gets all the stars today. Top is fabulous and just perfect for the visit. Her pony tail is the best and let’s us see how lovely she is - it also makes her look younger. And probably Is more comfortable and cooler. Rania looks great again. Great cause, very busy lady. I like her when she wears these beautiful and traditional outfits. She looks very engaged with these ladies, they are having a good time. I agree with everyone. I love her ethnic inspired outfits. She looks fabulous.